These last few days I’ve been absorbed in various late 19th century architectural journals — many have come on-line recently in OCR searchable format — looking for nothing in particular and enjoying nearly everything I find (i.e., stumble across). Among the incidental discoveries were a few of the late buildings by British architect J. D. Sedding, a familiar name who produced some unfamiliar work. Time to correct that situation. 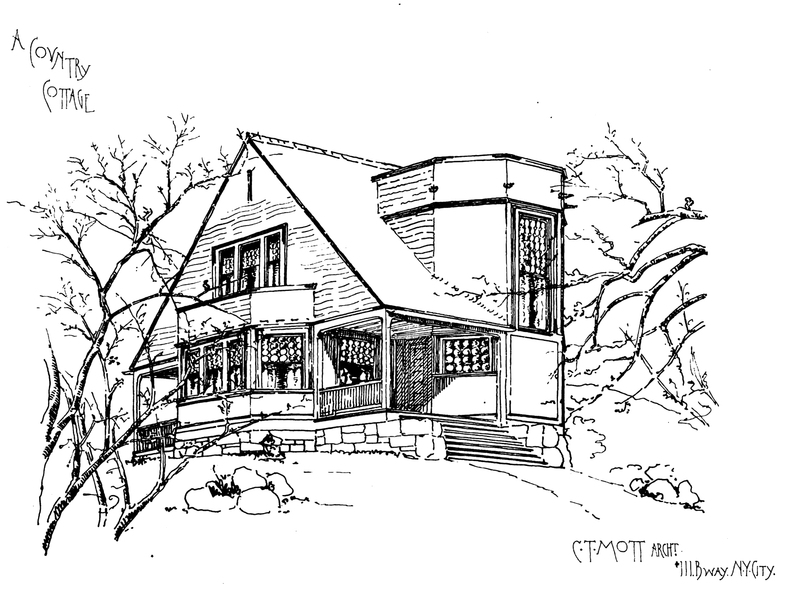 And then there is this charming pen-and-ink perspective of “A Country Cottage” by New York architect C. T. Mott. Charles T. Mott [1855-1935] was an architect of no great significance; I doubt that any history of architecture in New York State even mentions his name. History has a way of being written by the victors. Which often has absolutely nothing to do with the quality of the work. Witness this small, utterly charming house, whose plan I’ve been trying to imagine all afternoon. Sure, the Shingle Style is a favorite of mine, but this is textbook S.S. and as such deserves a place in Agincourt. By agincourtiowa in Uncategorized on Tuesday/09/October/2018 .